Wall Mounted Padded Folding Seat With Adjustable Legs. 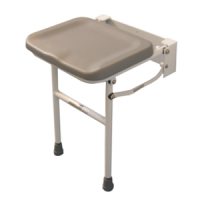 This folding shower seat is manufactured using a corrosion resistant, polymer coated, aluminium frame with fine adjustable drop-down support legs to give a neat and robust folding shower seat ideal for areas where space is limited. The luxurious contoured padded seat is ergonomically designed to enhance comfort, security and confidence to promote independent bathing. The seat is extremely easy to clean and incorporates a special integral anti-bacterial finish, which resists 99.9% of bacteria to include E. Coli and MRSA. Maximum user weight 159kg (25st). Good replacement for our old shower seat .